As my days draw to an end in Southern Arazona, I have a few more places to check out. I follow the signs on I10 and get off in the town of Bowie and head south. I arrive at a busy sign with no clear understanding on how to get to the Fort Bowie site. Sign has handicapped going one way and the other is to a trail. I took the road to the trail, although I was not looking to hike a second day in a row. The sign says 1.5 miles so that is a 3 mile hike. I head out with my backpack with water and the hike takes me past sites along the way that add to the experience of the visit. 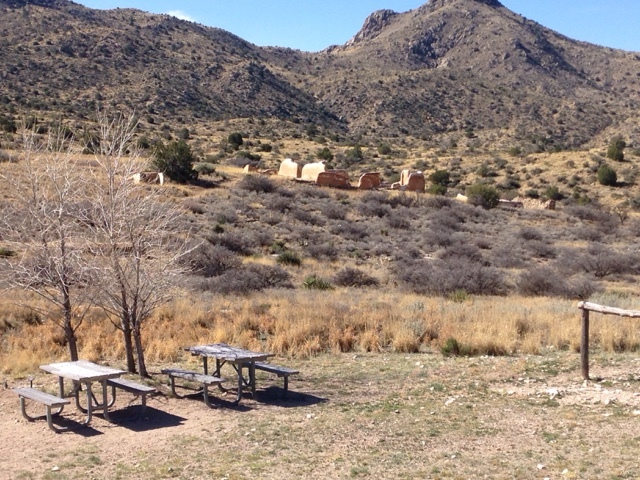 ( mining camp, stagecoach route, cemetery, Apache house, spring, original fort site, second fort site. 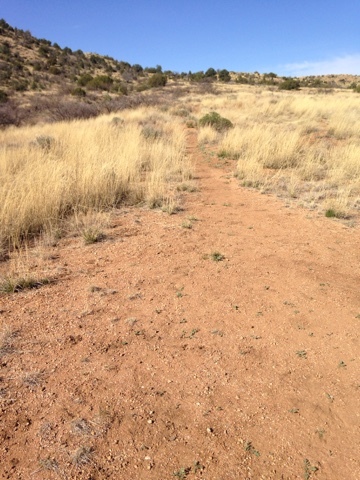 Above is the Butterfield stage coach trail through the grass. 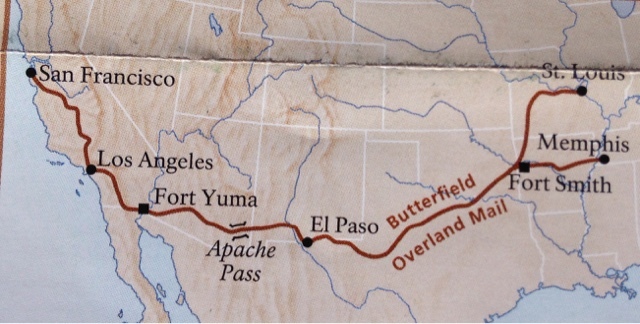 Here is a picture of the entire Butterfield Trail. Butterfield was given the contract to bring mail across country as previously mail went by boat to California. Butterfield used special wagons with mule teams to get over the mountains. 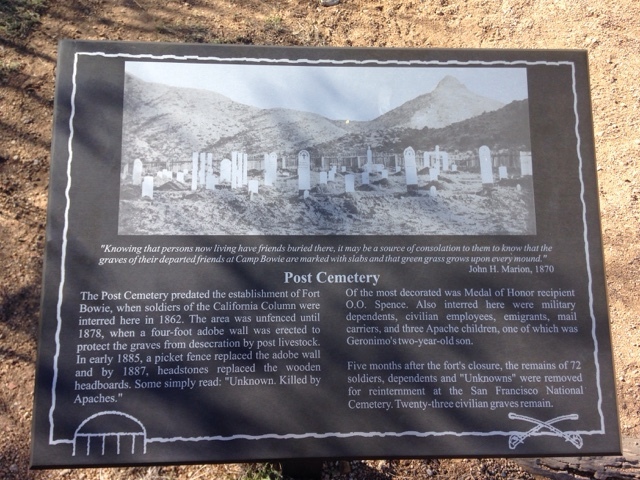 Along the way, there are plaques that provide explanation of the various things to see on your way to the fort. Above explains the cemetery that is here. The Millitary that were stationed here that were buried here originally were move to a national cemetery leaving only civilian graves. A stone wall around the cemetery has been replaced by a picked fence. 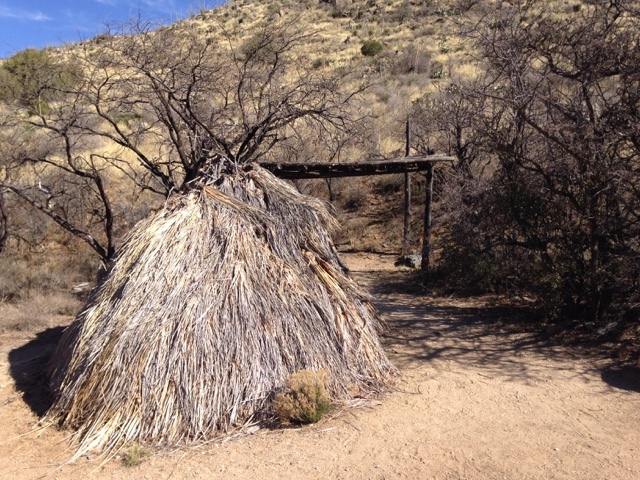 This is an Apache hut used during this period. 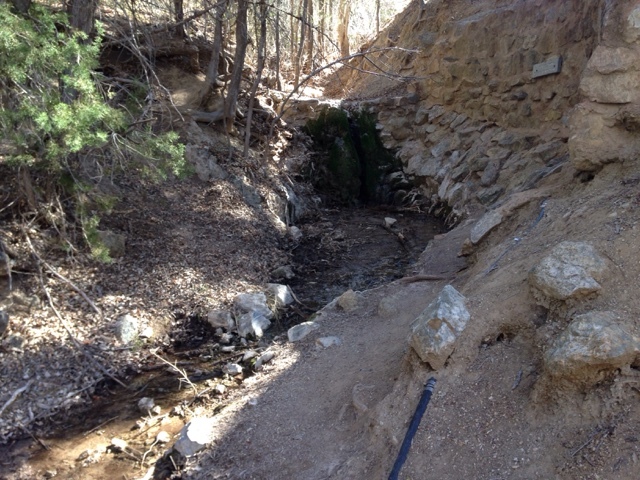 The Apache spring was an all important water source for the fort and the stage/mail line. This is the visitor center, small but nice. A woman who lives on site, is the host ranger today and she was very pleasant and helpful in answering my questions. She explained the sign difficulty I had. They do not want people driving to the site of the fort unless they are handicapped. They (the government) have to be ADA compliant, but driving here you miss the the walking history tour as this is the value of the hike you do not get driving. There are two fort sites. The on with partial foundations in the background is the site of the newer Fort Bowie and the other is a quarter of a mile to the right (west) of here. 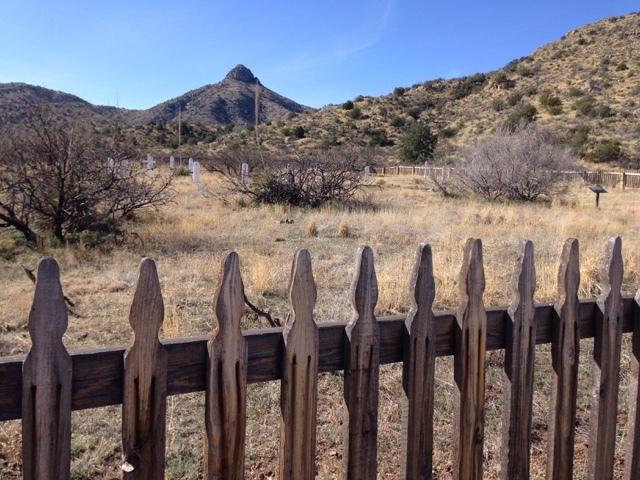 This site was used to address the Apache nation after the Cuvil War and Cochise who eventually had problems with the US Government and fought the troops at Fort Bowie, who he was once at peace with. 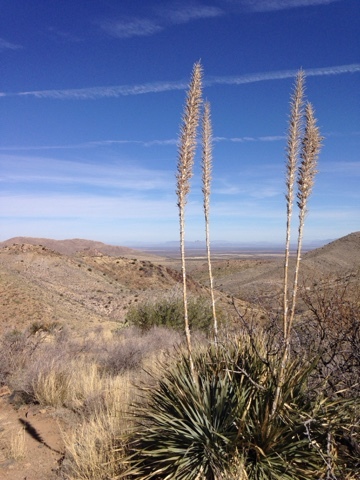 Cochise hid out in the hills west of these that they call the Cochise Stronghold. The ranger recommended that I hike the return trail up the hill behind the visitor center. It was a climb but the views of the valley were as good as she promised. Above is the picture I took from the top of the hill. 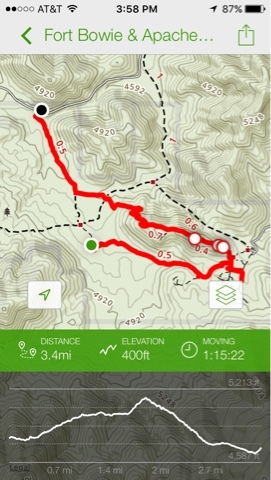 Again, I forgot to turn on my AllTrails app to track my hike out and back. The best I have is this stored track that someone else recorded. The only problem is that the red line is supposed to meet to form an upside down lollipop. 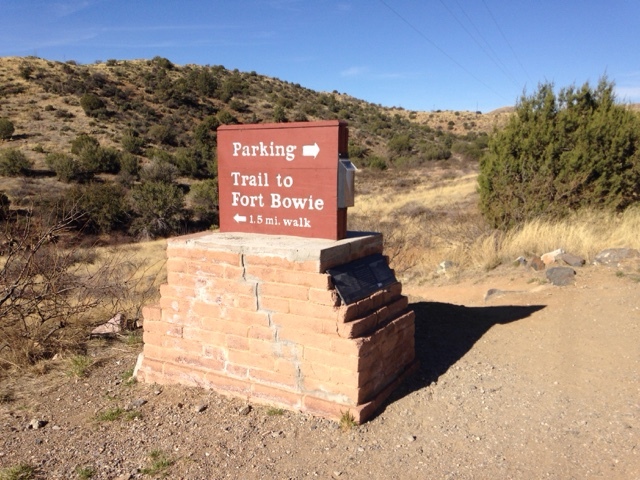 Overall, plan on a 4 mile hike and this include the spur at the bottom to view the Fort Bowie sites. I enjoyed the hike and self paced tour reading the panels, but my expectation before I arrived and when I had to hike I was coughs off guard. 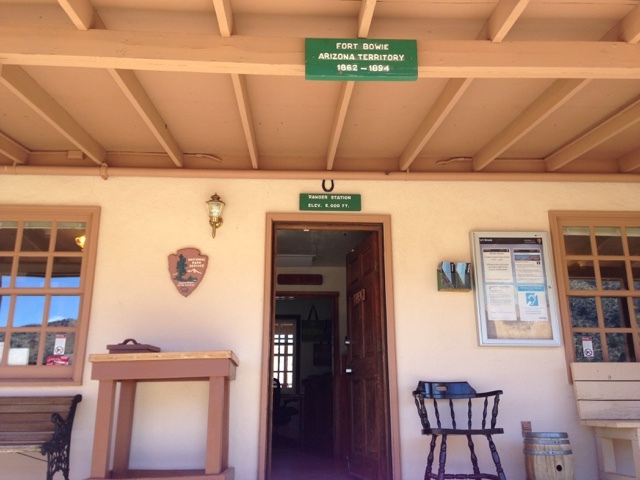 So please go to Fort Bowie but plan to hike 4 miles as this is the only way to take in the entire site. The Fort itself is moot as there are only foundations that remain of both the first and second fort. The experience is to enjoy the history as it unfolds as you walk. I walked out with an elderly couple that have been here before. They take their time and bring water and a snack.